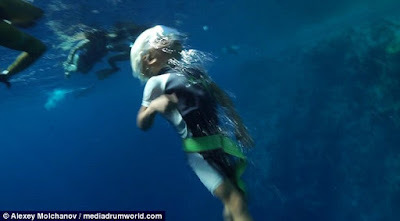 Here are incredible images showing the world's youngest freediver plunging 32 feet under the sea aged just three. Fedor Afonasiev has been diving without aged oxygen since he was a two-year-old, following in the footsteps of his adventurous parents. 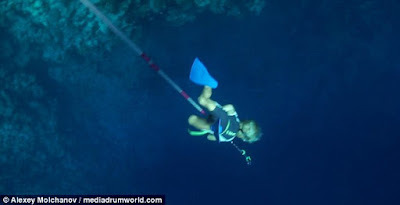 He was filmed pulling himself down a pole into the Blue Hole, a submarine sinkhole in the Red Sea, before resurfacing when he could not hold his breath any longer. 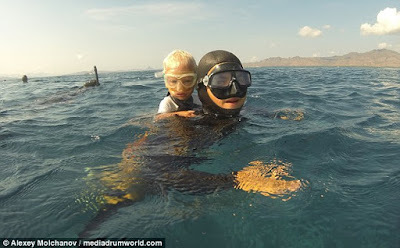 Fedor, whose parents are instructors, is also seen riding on his mother's back in video taken by professional freediver Alexey Molchanov, 29, from Moscow.